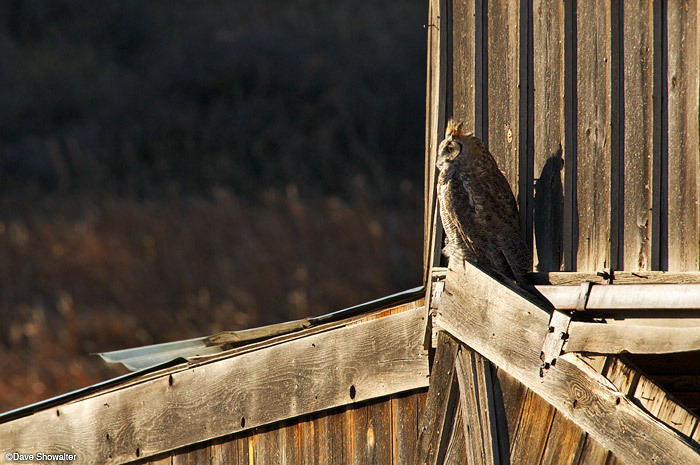 An adult great horned owl watches an area where grassland meets riparian from his perch on the historic Lindsey barn. Great horned owls are mostly nocturnal, but I frequently see them in daylight. This great horned owl is living the good life, with a spacious barn providing both shelter and perch to hunt for small mammals moving through prairie grass. I’ve seen him in daylight a few times, just yesterday here he was, hanging out in the mid-morning sun, sheltered from a ferocious wind. Courtship begins next month and he’ll have a good nesting site in the old barn. At 22″ tall, Bubo viginianus are by far our largest owl. They like rabbits and skunks, so it’s good to have them around, keeping both from overruning the earth. Imagine a world of skunks and thank a great horned owl. Posted in Prairie on October 19, 2012 by Dave Showalter. ← Previous: "Presentation At CSU Pueblo"
LOL No on the skunks and thank you Mister Owl. Researchers have told me about visiting a GH owl nest and being overpowered by skunk odor. It’s an acquired smell. Dave…love the picture and love learning new info about owls…Thank you!